Festival guests at Heartland Festival in Denmark donated over 200 Natural Light solar lamps under the "give one get one" concept and thereby brought light to schools and health clinics without electricity in Africa. 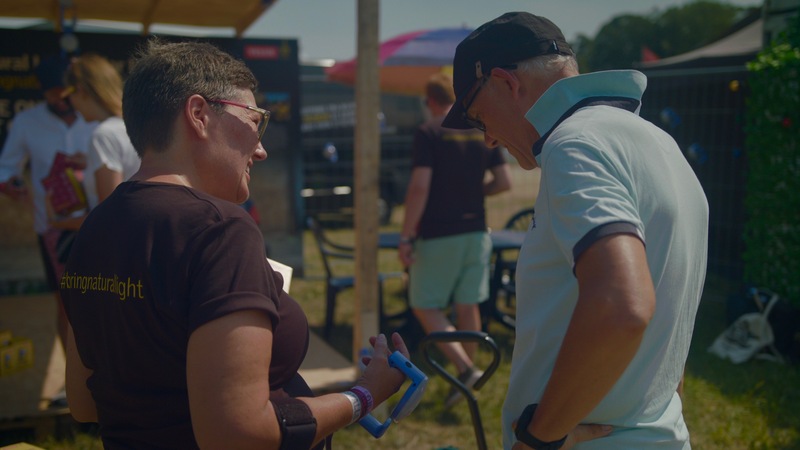 In the soaring Danish summer heat seven volunteer employees from VELUX went to Heartland to give the guests the opportunity to donate Natural Light solar lamps to schools and health clinics in Africa without electricity. It is the second year in a row, that the Natural Light project visits a festival. The Natural Light project had a stall and a mobile cart at the festival. At the stall festival guests could come by to hear more about the project, donate a lamp and see exhibited pictures of the proud donors. The Natural Light team also sold the solar lamp by pulling the cart around the campsite and meeting the guests in their tents and caravans. This setup proved excellent in order to engage the festival guests as they whole-heartedly embraced the project. The team received a lot of positive reactions and had many interesting conversations with the engaged guests at Heartland. The efforts yielded great results and in the end the festival guests donated over 200 lamps to schools and health clinics in rural off-grid communities in Africa through the “give one get one” concept. We are delighted that so many people are interested in the Natural Light project and we've received so much positive feedback from the guests. The crowd at Heartland is simply dedicated and engaged people who care for others. With such a positive outcome, the festival guests have certainly made a positive difference for schools and health clinics in off-grid areas of Africa. Thank you so much for your support for the project - we could not have done it without you. The Natural Light project is built around the “give one get one” concept. This means, that for each solar lamp the festival guests buy they also get one for themselves. They can as an example use the lamp to light up their tents at night, while the recipients, children at schools and nurses at health clinics, can use the lamp to study and treat patients in the evening when it is dark and there is no electricity. The lamps will most definitely make a difference in the rural off-grid communities in Africa where they will be distributed. When the lamps are shipped off to Africa, they will not be alone in the box. Included in the box will be a small picture of the person or people who donated that specific lamp. During the festival, the VELUX volunteers made sure to photograph as many donors as possible, so their picture could be printed out and packed in the box by the volunteers. This way, the recipient of the lamp knows who gave them the lamp!